Rita Ora was spotted arriving at London’s St Pancras railway station wearing a Max Mara Madame Double-Breasted Wool And Cashmere-Blend Coat ($3,890.00), a customized House of Holland Checkerboard Scarf ($48.00), a Chanel Calfskin Quilted Backpack ($3,295.00 – preowned), NOR Transmission Sunglasses ($68.00), Zoe Lev 14k Gold Tiny Hoops ($220.00) and Vans Old Skool Platform Sneakers ($64.95). Kristen Stewart was spotted leaving launch in Los Angeles wearing a vintage Airwalk Soft Tee (Sold Out), Levi’s 501 Ripped High-Waist Crop Jeans ($98.00), Ray-Ban Wayfarer Sunglasses ($153.00), her Jillian Dempsey Punk Lock Necklace (Sold Out) and Vans Old Skool Core Classic Sneakers ($59.95). 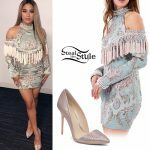 Rita Ora was spotted leaving Matsuhisa Sushi Restaurant in West Hollywood wearing a Charles Jeffrey Loverboy Out and Raging Wool Sweater ($555.00), cord pants similar to these from ASOS ($45.00), Prada Racing Mini Leather Crossbody ($670.00) and Vans Old Skool Sneakers ($60.00). 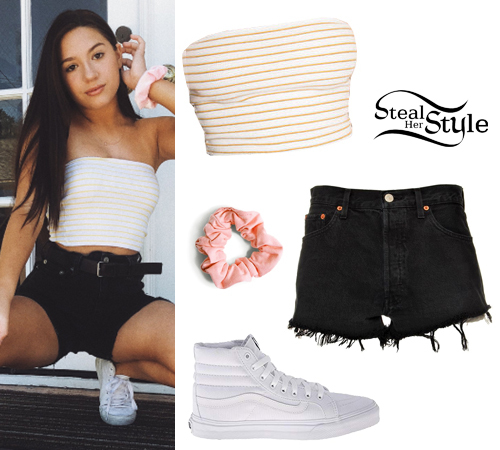 Mackenzie Ziegler posted a picture on instagram wearing a Brandy Melville Jenny Tube Top ($16.00), Levi’s 501 High Rise Shorts ($70.00), a pink scrunchie from the Urban Outfitters Days Of The Week Scrunchie Set ($12.00 – set of 5) and Vans Sk8-Hi Core Classics ($65.00). Kaia Gerber was spotted at SunLife Organics in Malibu wearing a Madeworn Motörhead Graphic T-Shirt (Sold Out), Re/Done The Shorts ($215.00), a Prada Nylon and Leather Belt Bag ($670.00) and Vans Mix Checker Old Skool Sneakers ($60.00). You can find a t-shirt like this one at H&M ($17.99). Dakota Fanning was spotted out and about in New York City wearing The Reformation Harbor Dress (Sold Out), a customized Goyard White St. Louis PM Chevron Tote Bag (Not available online), Elizabeth and James McKinely 51mm Oval Sunglasses ($185.00), a Yellow Gold SM Love Bracelet ($4,050.00) and a Yellow Gold Juste Un Clou Bracelet ($6,800.00) both by Cartier, and Vans Checkerboard Authentic Sneakers ($34.99). Hayley Williams posed with Work In Progress at the Barclays Center wearing a Ruth Ribbed Sweater Tank Top ($39.00) and a Classic Bandana ($10.00) both from Urban Outfitters, Molly Goddard Yellow Iliana Trousers ($473.00) and Vans Checkerboard Slip-On Sneakers ($49.95). Anne-Marie posted some pictures on instagram from her performance in Dublin wearing a Striped Cropped Denim Jacket ($50.00) and matching Striped Mom Jeans ($44.00) by Pull & Bear, with Vans Old Skool Platform Sneakers ($64.95). Meredith Foster attended Day 1 of Coachella Weekend 1 wearing Faithfull The Brand x Revolve Playa Jumpsuit ($169.00) with Vans Era Sneakers ($50.00).